Last of the Holiday Fair Ornaments. These will hang on the tiny tree ( about 7) for a little tree and they will be free. Our creativity today is from our painting for Holiday Fair which is first photo. Secondly is photography with a sand and shadow art photo of the universal 'shadow of man and frog' and last but not least our poetic creations ~ two haiku. All of these mediums seem to be flowing from my spirit and simultaneously filling my spirit with love and peace. Wishing you the best for the weekend. We love to have you post your comments, thoughts or questions to delight us all in the day ~ especially, ArtMuseDog^_^. beautiful as always, I always feel better just for coming here! What adorable ornaments! Happy PPF! What a wonderful post Carol. i love those ornaments very much ... will look great in your little tree. The both haiku are wonderfully composed. You did well on Carpe Diem's prompt 'jade'. Thank you for giving me a purpose to go on with Carpe Diem. Thank you for sharing. Awesome! I love the clothes line. I want to make one for Christmas cards. these little ornaments will glide into Christmas Day. Your ornaments are so cute! Good luck with your holiday show! 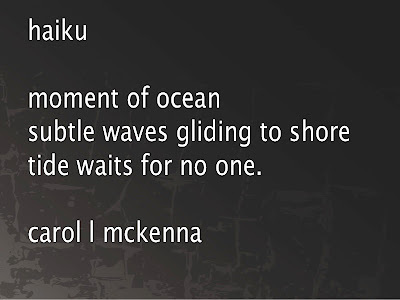 And haiku... both are fabulous, but I especially like the ocean one with your photo. Well done, Carol! Love the ornaments too. I usually knit or crochet an ornament for my son and DIL's tree every year. Happy PPF. they will not be hanging there long then...sweet...and I do love the sand and driftwood photo oh so much. HPPF! Beautiful haiku... 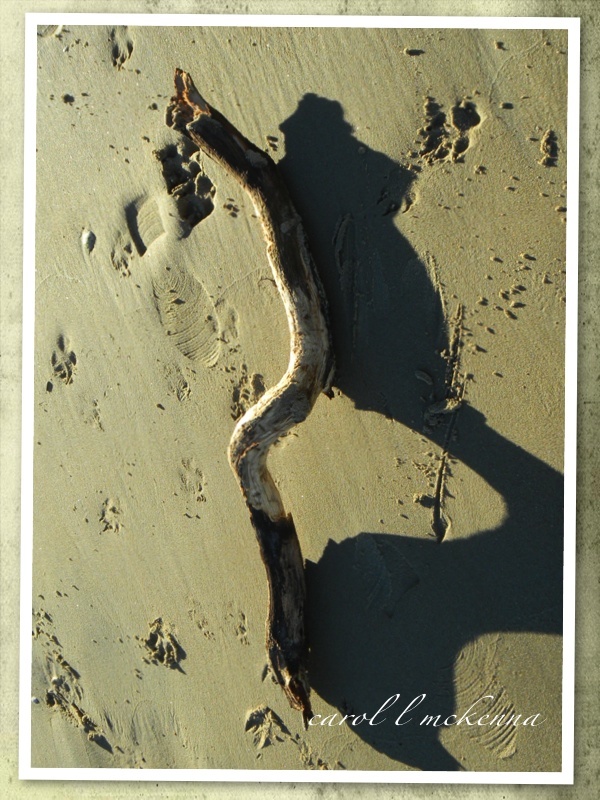 I'm thinking about that tide... and the shadows of the driftwood, are so evocative! Your ornaments are pure joy. 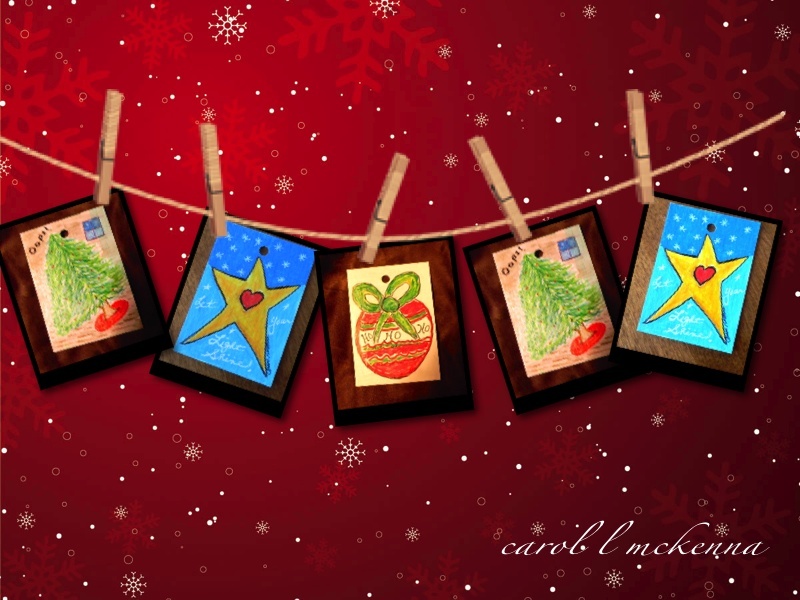 Thank you dear Carol! always so much beauty to discover here Carol. Love the ornaments. And I truly love that shadow shot! Outstanding. Grandfather sun outdid himself, and you there to capture and share. Wonderful! Love that photo of driftwood and your haiku! I miss sand and drfitwood! 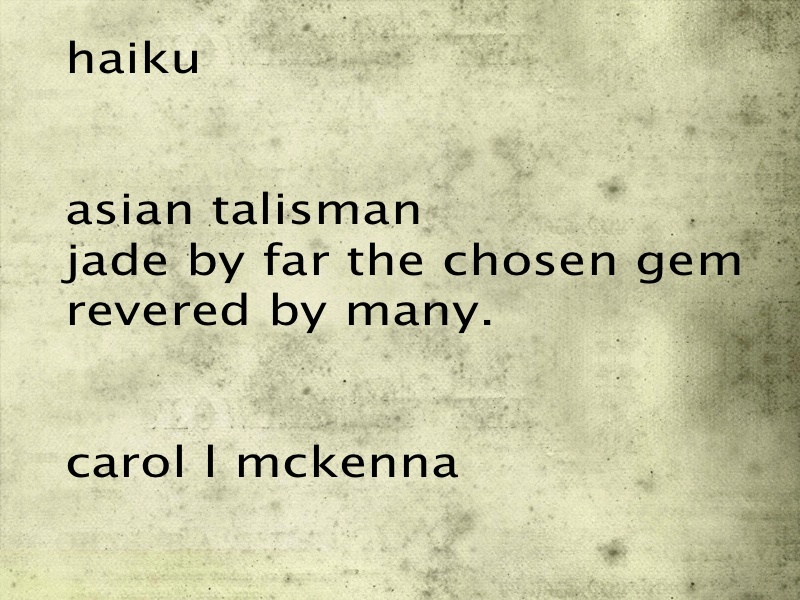 Love the haiku, Carol. Your ornaments are beautiful. Wish I could see them hanging on the tree. Such a lovely blend of words and images today, Carol. You warm my heart! Ornaments. Haikus. The ocean. Just another normal day in your Paradise, Carol. Loving it all. 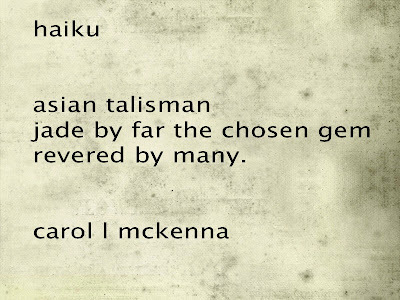 Talisman - wonderful word! Beautiful post and photos too. Your ornaments are great I love the photo of Man and Frog. Your creative juices are really flowing. i love your ornaments! and your wonderful, creative spirit. i'm in awe of all that you do! Love those ornaments as well. Everything is simply beautiful and thanks so much for sharing the other links as well! They're great blogs!! Love your ornaments Carol and so you have inspired me to create a few for our small tree. Interesting shadow as well. Of course your Haiku's are always spot on! Have a wonderful weekend, take care. 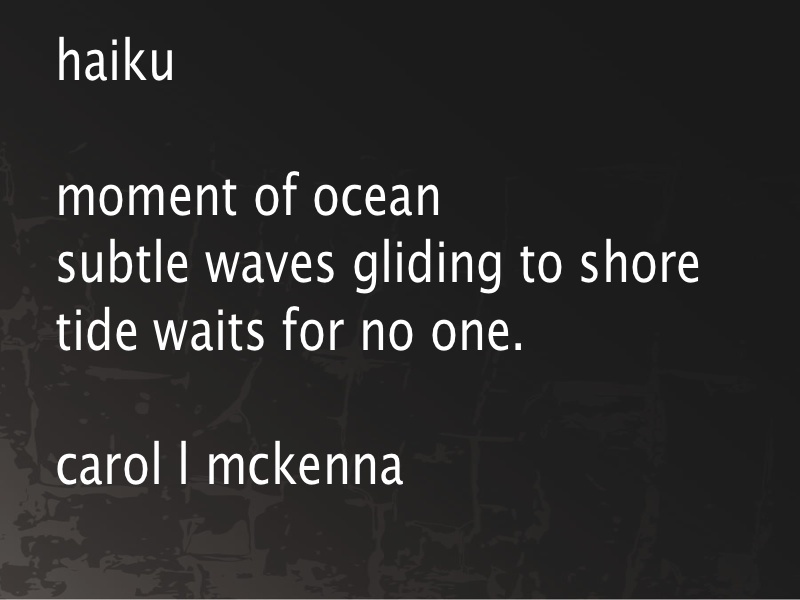 Another beautiful creation and wonderful haiku! Love your ornaments...and the haiku...and the photo with the funky shadow. Happy PPF! Loved them all Carol but the "shadow of man and frog" stopped me in (online) tracks. Stirred something deep in my soul. I love your photo - the shadow is wonderful! Before my brain completely got that it was a shadow, I saw it as a little gesturing figure. Such fun to visit you and Art Muse Dog and see all that you are doing. Yes your blog is delightful, it makes me feel good to visit. love to you,Diana happy weekend! Your ornaments look so cute and colourful, they'll be a big hit. Love your ornaments! Happy PPF! I love the joy in your post. Blessings! The sand and shadow picture is fantastic! I'm having a giveaway over at Art in the Garage to celebrate my 1000th post--hope you can stop by and leave a comment! Great haiku and I love the photo with the shadow... wonderful shapes! Your little ornaments are great, my mom used to get us to make things like this for out tree when we were on Christmas break and driving her crazy! Love those ornaments, very creative! Thanks for sharing with Foto Friday! Tide waits for no one...rise on the tide while you can! I like your holiday ornaments. Your shadow of man and frog is fantastic - love it! These are so festive - they really put me in the holiday mood. Very colorful little ornaments. I especially love the shadow stick and the haiku about Jade.